There have been a spate of recent predictions on where the Indian economy will be over the next few years and where the Indian stock market will be. Well, all I can say is that all those studies are really very poorly done and mis- informed. The people who authored these reports about (a) India getting all those inflows from foreign investors, (2) on how India's GDP will grow to some jaw-dropping trillion number, and (3) why India is rapidly rising in the global rankings have not really done their homework well. They need to reexamine their Microsoft Excel sheets and start using the power of an unlimited spreadsheet....one that can head towards infinity in imagination. They need to stop being so "bearish" on India! Secondly, Master of Universe is sort of tainted by its association with the ungod-like quality of greed. And while God is never tainted, the fact that certain co-inhabitants of Planet Earth, belonging to the homo finance strain, have claimed that derived status of "doing God's work", makes me averse to any Master of Universe title. I will leave that sole distinction to the people at Goldman Sachs whose CEO - during a Senate Committee hearing on the workings of financial firms and how they blew up more lives than ISIS, al Qaeda, and LeT combined with their nefarious activities - said that they were doing "God's work". Yeechh! The BJP may want to look into this other Jihadist, warlike militancy that many financial firms have waged on their customers. Love Jihadis decimate the population of one religion; these financial folks are out to decimate civilization - irrespective of religion! Watch your wallet! But let me get back to the point and not digress - as I seem to be doing - into the familiar pattern of my questioning the ability of the BJP to fast-track the economy into Vikas mode or the "we exist for ourselves" DNA-structure of the honchos in the field of finance. Back to the rationale for my crown of the self-proclaimed "Biggest India Equity Bull on Planet Earth" title. Do this test of Exhibit A along with me. In the year 2017, I am 57 years young as per my passport. Please note that I felt 37 years young. Well, until the fact that on the night of October 30th I slept on a hotel bed and seem to have messed up my back. Within 6 days I have had cranial osteotherapy, massages, physiotherapy, and acupressure therapy. In my previous 50 years of consciousness I have probably had 2 massages. But, to get back to the point, I am 57 years young - subject to my back allowing me to behave like one. In the year 2050, 33 years from now: how old will I be? That's easy. The answer is 57 + 33 = 90 years. So how old will you be 33 years from now? Okay, did you get the correct answer for your age 33 years from now? That means you are smart. Like me. Now we qualify for the next test in Exhibit B of seeing how smart we really are compared to the Finance Ministers of India. 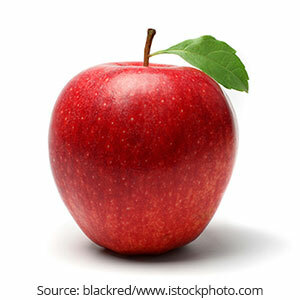 Good, it is an apple. 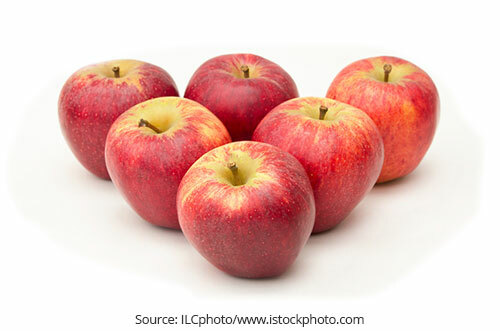 Excellent: It is a picture of 6 apples. By getting the answers to these apple questions correct, you are smarter than each of the recent 3 Finance Ministers of India! Between 2004 and 2017, India has had 3 Finance Ministers: Mr P. Chidamabaram; Mr Pranab Mukherjee; and Mr. Arun Jaitley. The income-tax departments which they oversee as Finance Ministers have correctly seen the photograph of one equity mutual fund and called it an equity mutual fund. This made it eligible for taxation as "equity": if you own the equity mutual fund for over 1 year, your capital gains tax is zero. 1 EGG IS AN EGG, 6 EGGS ARE A CHICKEN? However, when you show them the photograph of 6 equity mutual funds in a basket, they have classified it as a "debt fund" and have been taxing it as a debt fund for capital gains. Either the Finance Ministers are not aware of the creative genius of the department that works under them - or they probably have never invested in an equity fund of funds to understand the real impact of this contortion of a photograph of 6 equity mutual funds into a debt fund. Even the great magicians and illusionists like P. C. Sorkar and Houdini may find this feat of converting equity into debt a challenge. Removed from reality and not shopping for daily groceries or dealing with the eager financial planner makes those who oversee policy lose sight of reality. They are not really experiencing the aam aadmi day. Hence, Finance Minister Mukherjee could happily introduce a law to charge tax retrospectively without thinking about the moral right of such a move. Imagine if he had gone shopping for vegetables and the vendor charged him higher prices retrospectively for all the vegetables he had purchased since he moved to New Delhi. How would he have liked it? Similarly, Finance Minister Jaitley could say with great confidence that a Rs 500 note was a "High Value" note and not realise that it is a "High Denomination" note. If the FM had been to a grocery store he would know that it is a pretty worthless exercise to carry a Rs 100 note for shopping during Samvat 2073, when Rs 100 cannot buy you what 1 anna bought you in the good old days when Sita went shopping for food circa 5,000 years ago. A commentary of the scriptures should contain that important nugget of information that distinguishes between High Denomination (a number on the note) and High Value (what it can actually purchase)? 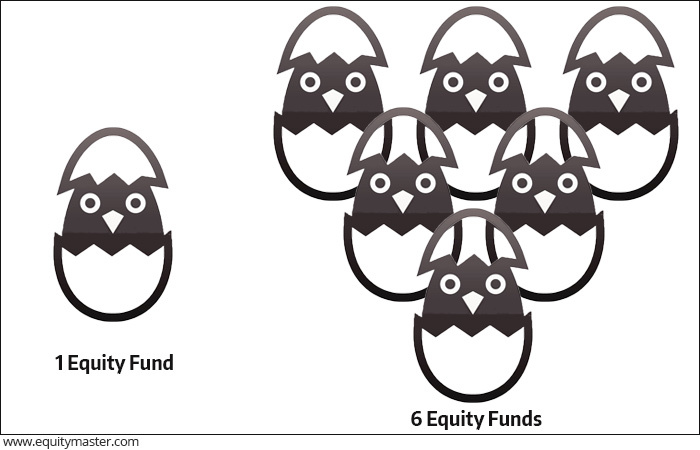 Identifying the fact that 1 equity mutual fund is an equity mutual fund and that 6 equity mutual funds in a basket of an equity fund of funds is also an equity fund. Our smartness will now take us -and the BSE-30 Index - to a level never explored by any of the talking heads you see on the business news channels. In 1979, the BSE Index was 100. Today it is over 33,000. That is a return of over 17% per annum. If we were to add back dividends received and assume that they were to be reinvested in the BSE-30 Index, then the return is nearly 20% per annum. Over the past 37 years, the Indian economy has grown by a real rate of GDP of 6.3% on average. Inflation, as measured by the CPI, has been in the 8% range. Add the two together and you get 6.3% + 8% = 14.3%. Let's round that down to 14%. This is the approximate rate of growth of activity in the overall economy, taking into account the level of prices of various goods and services at that point in time. This is also called the nominal rate of growth in GDP. So, the economy grew by 14% per annum for the past 37 years and the BSE-30 Index grew by 20% per annum. Why is there a gap between the two? GDP represents all economic activity: of good companies, of bad companies; of successful venture, of failed ventures; of hard working people, of retired people. Companies that are managed by CEOs, CFOs and CCs (Crony Capitalists, in case you are wondering what that CC stands for!) are likely to grow faster than the average rate of economic activity in the country. More importantly, listed companies are generally growing faster than private companies. Then, when a listed company makes it to a select list to be part of any Index, like the BSE-30 Index, it may grow even faster than the general rate of growth in all listed companies. If a 14% nominal rate of growth in the economy between 1980 and now resulted in a 20% average per annum growth in the Index over the past 37 years, then what should a 11% per annum growth in nominal GDP result in over the next 33 years - till the year 2050? Table 1: If you have to dream, dream big! That's right: if the nominal rate of growth in GDP will be 11% per annum for the next 33 years, then the market may give a 15.71% rate of return and the BSE-30 Index will be 4,076,470. No errors: I checked the formula. Four million seventy six thousand four hundred and seventy! By the time the business news anchors will say what the Index level is, it will have moved a few thousand points...and they will need to say all those words again! I am not likely to be around in 2050 (if I am, I will be 90 years old and will not waste my limited time watching business channels!) but it would be fun to watch the anchors running out of breath recording the movement in the Index. And, on a side-note: look at the power of compounding: the power of taking a rate of return and extending it into the future. If we drop the assumed rate of return from 15.71% to 15% (a drop of 4.8%) the Index is projected to be "only" 3,323,094 - which is 22.7% lower than what it could be if the annual rate of return stayed at 15.71%! To sum up, I am a big bull on Indian equity. The others are fooling you with limited use of their spreadsheets. If you have to dream, may as well dream big! The bigger question - and the unknown - is what sort of country will India be in 2050? Will it be a great country to live in - where everyone is moderately happy and has the roti, kapda, aur makaan that Mrs Gandhi promised Indian since the 1970's and every Congress government has failed to deliver! Will it be a country full of ache din as the current BJP government promised us? Will we be covered in smog or blessed with our time in the sun? Will we be allowed to eat what we wish to eat and dress the way we wish to dress - or will we have to wear khadi white or saffron? Will we have money but no wealth? I will leave the answers to those more difficult questions when I give my acceptance speech for receiving the award of the Biggest India Equity Bull on Planet Earth! Equitymaster requests your view! Post a comment on "Why I am the Biggest India Equity Bull on Planet Earth!". Click here! 5 Responses to "Why I am the Biggest India Equity Bull on Planet Earth!" I enjoy reading The Honest Truth (even if I don't understand all of it all the time - I'm quite new to your world of finance and still struggling with the terminology!). The 1 fund vs fund of fund logic has me puzzled everytime I hear / read about it - either at a Path to Profit or in a newsletter. While it makes me happy that I am smarter than 3 FM's (! ), what I want to know is why they allowed this in the first place. Do you think SEBI chariman would have an answer? Better question - whom do you suggest to approach to get an answer? (1) I would be keen to know what conclusions does a similar analysis for Dow Jones yield? (2) What is the government's logic in classifying the fund of funds (which invests in 6 equity funds) as a debt fund. They must have given a reason - please share it with us. is - if we are not careful, we will be beheaded/trampled upon by Islamic army, much like the ISI; Our women-folk will have to cover from head to toe, all men-folk will need to have a topi, keep long beards (sans mustache), all of us will take directions from some obscure Maulvi to perform our day-to-day chores, and we will perhaps be forced to eat beef. Sometimes, I think you rhyme with that bigot John Dayal. No offence!